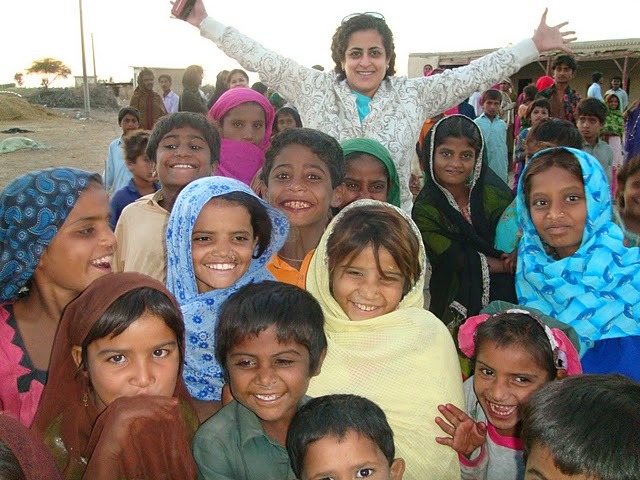 When the New York-based Dr Geet Chainani decided to come to Pakistan last year in search of her Sindhi roots, little did she know that she would end up staying for months – finding not just her roots but “a sense of peace” as she puts it, in alleviating the misery of flood-affected villagers in rural Sindh. Aman ki Asha has been in touch with Dr. Geet Chainani since early February, when she emailed our contributor Zarminae Ansari, whose articles she had seen on the website http://www.amankiasha.com. This is an attempt to highlight not only Dr Chainani’s work in Pakistan, but also her thoughts as a humanitarian, and as a supporter of peace between India and Pakistan. For the first six weeks after her arrival in Pakistan on August 30, 2010, she volunteered her medical services with the Organization for Social Development Initiatives, a Karachi based NGO. She has since been working as the director of public health of Life Bridge US (an organisation she founded) and regional director of public health for the US-based Real Medicine Foundation (RMF). The complication is that although she is an American citizen, Geeta Chainani was born in India. 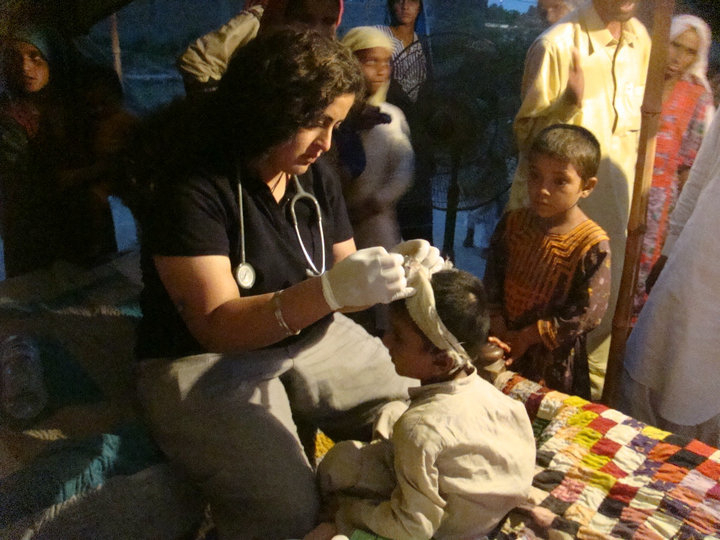 Visitors with Indian origin often find it difficult to obtain visa extensions in Pakistan, but so far, Dr Chainani’s voluntary work has helped her to obtain the necessary permissions to stay on – which she would like to do “as long as Pakistan lets me”, in order to continue working with villagers around Dadu and Thatta. “Upon arrival in Pakistan I found myself in Shikarpur and Khairpur providing medical relief to displaced flood affectees in tent cities. Pakistan was in a state of emergency and the least I could do was help to keep people alive, having trained for six years to do just that. It’s been four months and I am still here, working to provide flood affectees with health care in the interior regions of Sindh,” she wrote in her email to Zarminae. “The most important part of my experience is the way Pakistan has welcomed me. The brotherhood I have felt in every single meeting since the day I first arrived has moved me beyond words. I have felt more love and genuine concern in Pakistan than anywhere else. And I have yet to see or understand how a Pakistani is any different from an Indian. “As an American I know there is a fine line we all draw between the two communities differentiating ourselves from each other. The truth is we are probably the two closest communities in all of South Asia,” she wrote. Dr Chainani is currently working to set up sustainable health and education services through Life Bridge Pakistan and Real Medicine Foundation. She is also discussing partnership options with organizations like Shine Humanity, Comprehensive Disaster Response Services (CDRS), and Naya Jeevan in an attempt to prevent the duplication of services and provide a whole bodied, integrated and sustainable approach to healthcare delivery. Dr Chainani also works with the District level governments to implement health care capacity building strategies to the flood devastated regions. Realising the donors’ need for transparency and accountability, she is working on a web and cell phone based programme to provide transparency. This year, she dedicated her birthday in February to RMF and Life Bridge Pakistan flood relief efforts, asking friends to donate to these causes rather than spend money on a present for her. “It kills me that the international media has moved on from the Pakistan floods so quickly, even before the water level had decreased,” she says, emphasising the need to raise awareness in the international media about the flood victims and the on-ground realities. Her views are endorsed by another medical doctor from India with Sindhi roots who was in Pakistan working for flood relief last year – Dr Manohar Jethani of Chicago who came here with Dr M. Murtaza Arain (read about his experiences in Aman ki Asha: ‘My DNA is in the dust of Pakistan’. Dr Jethani has been involved with humanitarian work in various countries for several years. “I would love to be able to do some charity work in Pakistan annually if I could,” he wrote in a recent email to Dr Chainani, who had contacted him with Aman ki Asha’s reference. I commend Drs Chainani & Jethani for their work there. Not that we in India are particuarly ahead; read Dilip D’s blog or Dr.Ramani (field notes) to know how abysmal medical care is in some of our hinterlands. I found this non-sequiturish and militant even if they are talking about medical personnel. I wonder if Dr.Chainani would have made the same statement in the same way in Chattisgarh. I dont find Dr.Ramani or any of our medicos in similar situations making military/ fighting analogies and also invoking God at that. Even those that refer to God do so in terms of mercy and prayer. Maybe I’m over-reading this and its an individual trait, but this could be an interesting difference between our societies. What difference between “our” societies are you referring to? The lines in quotes from my earlier comment are a very unusual way to refer to medical people responding to medical situation here in India. 1. It could be an individual trait of Dr.Chainani. 2. It could be that God and soldiering in the path of God is so commonplace a usage in Dr. Chainani’s environment that she picked it up therefrom. Once again let me close with my appreciation for Dr.Chainani’s work, the mountain to this molehill of a comment. But I still wonder if she is going to do the similar work in GadhChiroli, Maharashtra. Maharashtra hosted sindhi refugees who fled genocide in 1947. Her nani could teach Sindhi to her because she found security in Maharashtra, India. Moreover, how much of this is “cool factor?” Among the ABCDs who grew up in US in 70s and 80s India was so called enemy of USA. All the news on the TV and news papers were negative ones. Islam was the greatest friend of America with sage Reagan comparing Pakistani/Afghani Mujahids with George Washington and Jefferson. No wonder the generation which grew on such lie sees the “religion of peace” and Pakistan as the best thing happened to humanity after sliced bread. During this time it was cool to read Rumi and white wash Islamic atrocities all over the world. Rumi is more Dharmik/Zarotrostian than Islamic. Reagan’s Pakistani Mujahid Jeffersons would have chopped his head at the first opportunity like Aurangzeb did to Sarmad and his own brother who started translating Vedas and took one Hindu as his Guru.